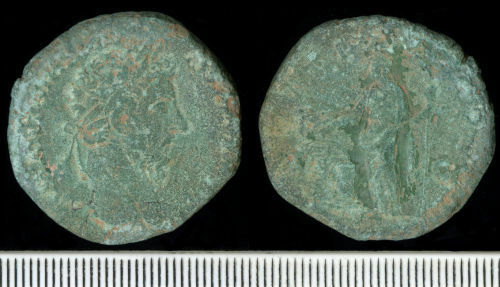 Copper alloy sestertius of Marcus Aurelius as Augustus (AD 161-180), dating to AD 169-71 (Reece Period 8), [SALVTI AVG COS], S C, Salus standing left. Mint of Rome. RIC III, pp. 290 & 293, cf. nos. 964 & 1009.